A temporary, two-way bikeway put in place on a short stretch of the Embarcadero last week provided a brief glimpse of what a permanent, safe bike route along the waterfront could look like. The SFMTA also installed bicycle traffic signals “to ensure safety and to control traffic,” Jose said, though they will be removed. Traffic signals normally seem to require a significant amount of time, funding, and engineering to install, and it’s unclear why the SFMTA was apparently able to implement and remove these ones so swiftly. Of course, the installation wasn’t a perfect, complete model for a protected bikeway along the length of the Embarcadero. 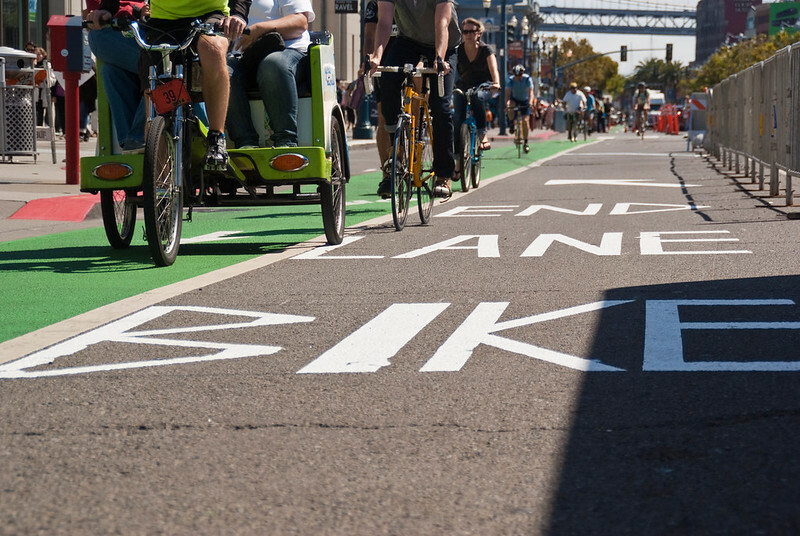 It ran less than half a mile, from Washington to Green Streets, outside of which people on bikes were dumped back into the Embarcadero’s regular configuration with green-painted bike lanes on opposite sides of the street, which are frequently blocked by drivers. Most southbound bicycle riders continued to use the regular south-side bike lane, rather than the temporary bikeway, as crossing over to the opposite side of the street to use the temporary bikeway was, for many people, counterintuitive and inconvenient. Reaction to the bikeway seemed generally positive — for one, it encouraged bike riders to not use the wide but crowded sidewalks (though biking on the Embarcadero’s northern sidewalk is legal). 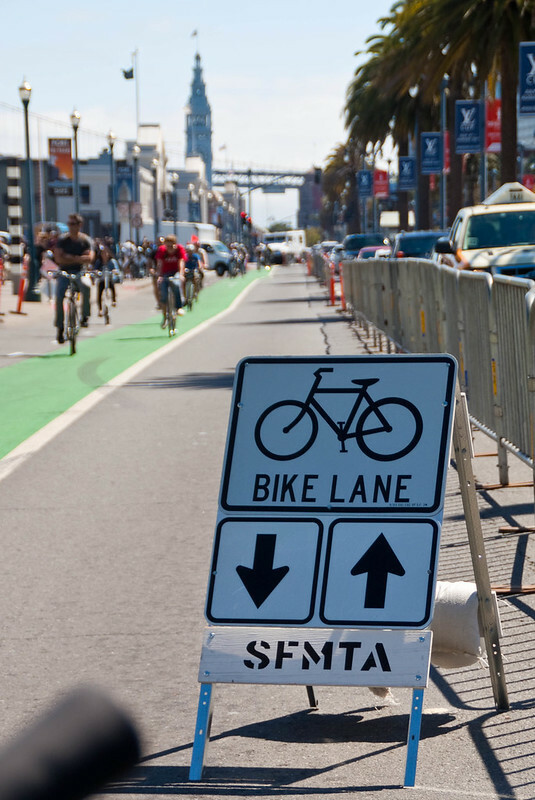 The SFMTA tested out a similar one-way bikeway during last year’s America’s Cup races as called for in the mayor’s People Plan. 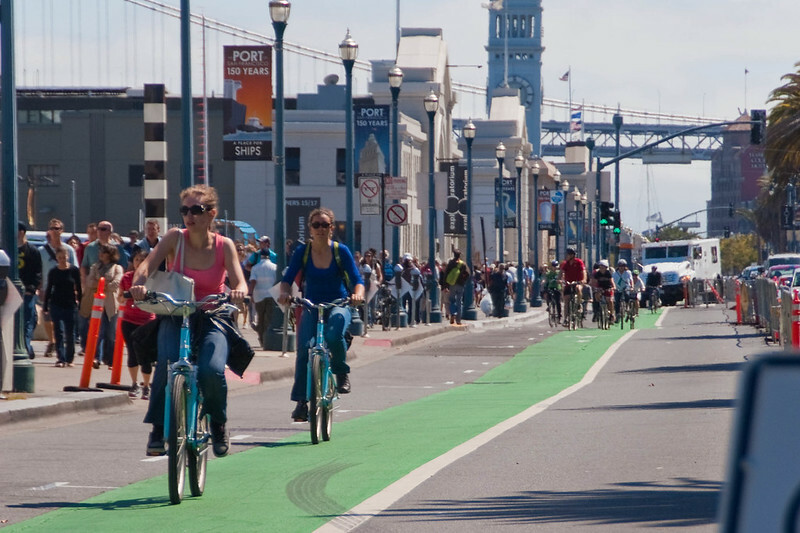 A protected bikeway along the waterfront has long been a goal of the SFBC and SPUR. The separated bike lane is great for bicycle traffic heading north along the Embarcadero, but pretty useless for southbound traffic since it is really not obvious how to get to the lane (from Fishermans Wharf). 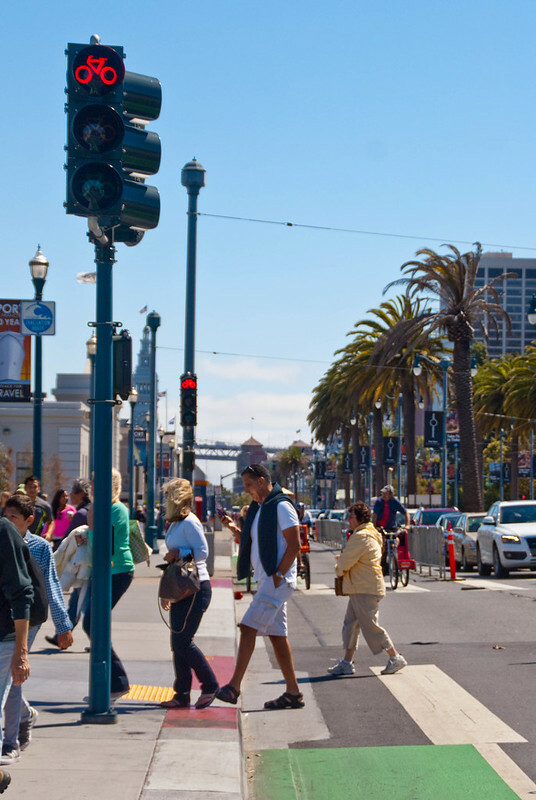 A 2-way bike lane would be tremendously more useful if it actually connected two major destinations (like Fishermans Wharf to the Caltrain station). That way bicycle traffic can just stay in the protected lane for the whole route instead of zigging and zagging to get to and from the lane. The Pier 23 guy isn’t thinking straight. Who’s more likely to stop in at his restaurant: someone in a car that has to find and pay for parking or someone who is riding a bike and can stop on a dime, lock up to a rack or railing and be sitting at a table in 5 minutes? I’m sure there were as more people walking and on bikes vs in cars on any given day too. With more safe space for both, there will be more, arriving from BART, Caltrain and Muni, especially with bike share now running. 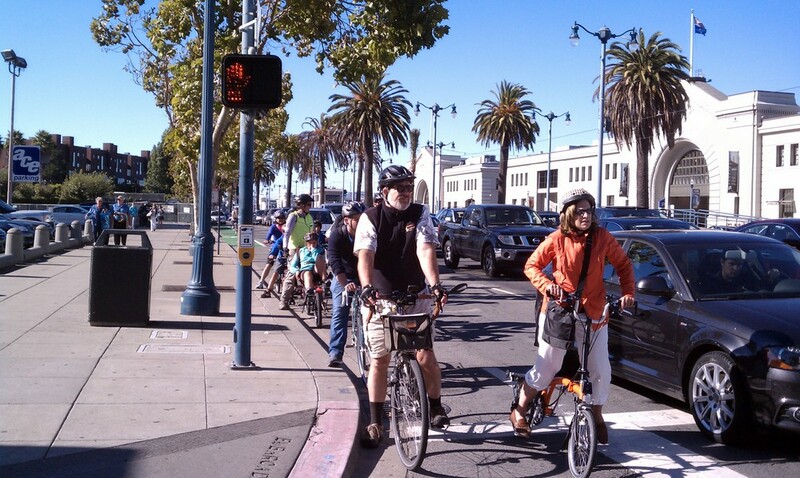 If any place in the city should be safe for all-ages bicycling, it’s the Embarcadero. We already decided years ago that our waterfront shouldn’t be a freeway, and it shouldn’t be a highway or arterial, either. It’s not a sport, it’s transportation. The Embarcadero is a giant on/offramp for 280 and the Golden Gate Bridge. What a wonderful space the waterfront could be for people, but instead it’s largely a wasteland. I love this article, and the accompanying video, because it demonstrates how gosh darn easy it is to make cycling appealing to the masses. Don’t need bike studies, or pilot projects– just give people cycling about 6 or 7 feet to travel in a single direction and physically separate them from motorized traffic. This wide, two-way Embarcadero bike path should be a no-brainer happily embraced by the local businesses. Those people cycling are having fun and enjoying their surroundings. If families, weekend visitors, and tourists are cycling it’ll give them a good excuse to work up an appetite and conveniently end their bike tour along the waterfront at the local restaurants. In dense parts of the city like this a two-way path is usually not ideal as it makes intersections more complicated – that is, IF these intersections have bike-only lights and so on. But of course all the action is one side of the street so a two-way makes sense here, if it is wide enough, fully-separated and has safe crossings with signals to intersecting streets and the minority of direct destinations which are on the south side. To reduce noise and encourage further safety, there should also be a 15 mph speed limit — what is it now, 35 mph? Sailing or cycling? Both are both! Heading eastbound I rode on the sidewalk before the path started. It was at night so I basically had it all to my self. Riding to the right, next to the barrier, was a little harrowing with oncoming vehicle traffic. All in all, with the bike signals and extra space it was pretty nice. Still had to watch out for cross-traffic heading in and out of the driveways though. That KTVU quote at the top is priceless and deserves video memeification somehow. The tools are coming soon that will allow this. That *is* rich! Should definitely be memeified. Way to concern troll, KTVU.